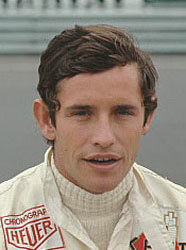 Jacky Ickx is more famous for his sportscar exploits, including six Le Mans 24 Hours victories and two world titles, than he is for his F1 career. That tends to overshadow the fact that, at his peak, he was one of the top single-seater drivers in the world. Eight GP wins, including two at the Nurburgring, 13 poles and 13 fastest laps indicate his quality. Ickx's Ferrari took the fight to Jochen Rindt and the Lotus 72 during the 1970 season, narrowly losing out in a slipstreaming thriller at Hockenheim. After Rindt's death at Monza Ickx became the only man who could overhaul the Austrian's total. He just failed and thus finished runner-up for the second successive year. After more successes for Ferrari, Ickx's F1 career went in to decline, but there was still time for one more success. Driving for Lotus, Ickx took a fine victory in the 1974 Race of Champions at Brands Hatch before eventually moving full-time to sportscars. Should Jacky Ickx be higher or lower in F1's greatest drivers?